Microinsurance refers to insurance for individuals with low incomes, giving poor people the ability to manage risks in their lives. Essar Telecom Kenya launched under the brand "yuMobile" in December 2008. It is the fourth largest mobile network operator (MNO) in Kenya with a subscriber base of 2,659,647 as of June 2012 (CCK, 2012). They offer services which include voice, SMS, mobile data, mobile money transfer (yuCash), and electronic mobile top up. They are also the latest entrant in microinsurance with "yuCover." yuCover is a loyalty-based insurance scheme that rewards yuMobile subscribers with a life insurance scheme dependent on their airtime usage. In 2012, the operator introduced to its subscribers monthly life and disability coverage based on their expenditures on the network, but the uptake remains low. This study explores the challenges facing the uptake of the yuCover microinsurance scheme in Kenya, and recommends mechanisms to mitigate these challenges. The research design that was adopted for this study is a descriptive survey. The population of the study was yuMobile subscribers while the accessible population was made up of 2,000 yuMobile subscribers sampled from the entire yuMobile subscribers’ population, which was stratified according to the location of the relationship centers. Registered subscribers who spend at least US$1.20 per month receive insurance coverage for themselves in the event of natural death or permanent disability. The more customers spend, the higher the insurance coverage they receive. In the event of a natural death or permanent disability, the subscriber’s family member registered on the insurance plan is required to report it along with the deceased’s death certificate to redeem the policy. Yu MNO partnered with Jubilee Insurance Company and Micro-Ensure to launch a loyalty-based insurance scheme with renewable monthly life and disability coverage based on the amount of airtime that they recharge each month. Jubilee insurance is the underwriter of the coverage, underscoring the growing convergence between MNOs and financial services companies, most notably banks. Distribution channels independent of the MNO--like churches, travel agencies, and self help groups--are essential in bringing microinsurance closer to the uninsured poor population. The yuCover scheme is a direct sales venture and uses mobile technology as the only distribution channel. This leads to low personal interaction about insurance between the insurer and clients. Clients can get information about insurance through the MNO’s unstructured supplementary services data (USSD) enabled menu. 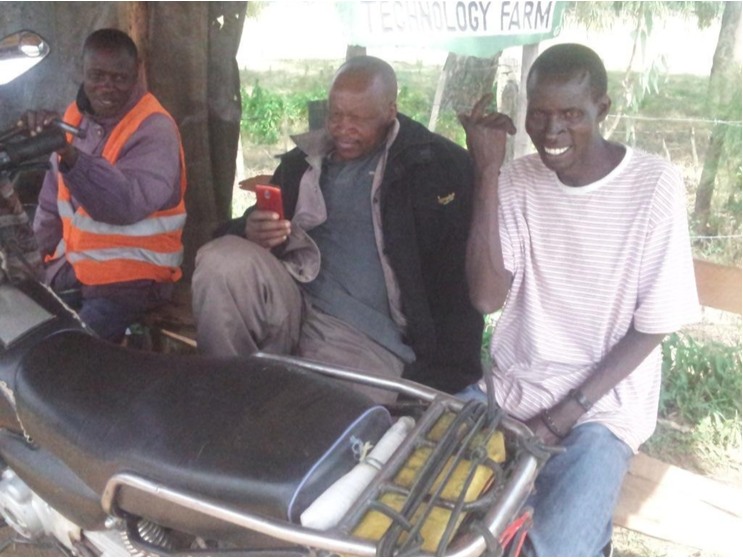 This leaves the uneducated, informal population and those who do not own mobile phones excluded from the scheme. This distribution channel is limited to the yuMobile operator and the underwriter. The MNO has little direct contact with clients, which has presented a challenge for the insurer to make sure that clients understand the product. 70% of yuMobile respondents confirmed that they did not have any idea or understanding about the service and 89% reported that they did not understand it well, even though the MNO has USSD-enabled menu where customers can get insurance information. There is lack of insurance culture--the characteristics of a population as defined by an arrangement in which there is a guarantee of compensation upon the occurrence of an event--in Kenya. This is partly due to negative perceptions about insurance as a financial tool. Clients still perceive insurance to be a luxury service for the elite classes. This might be attributed to lack of proper information on the importance of insurance and lack of trust in insurance companies. The Insurance Act (Laws of Kenya, Chapter 487) is the statute that regulates the Kenyan insurance industry. The Association of Kenya Insurers (AKI) self-regulates insurance policies and practices while the Insurance Regulatory Authority (IRA) has been mandated to supervise and regulate the insurance industry. The professional body of the industry is the Insurance Institute of Kenya (IIK), which deals mainly with training and professional education. 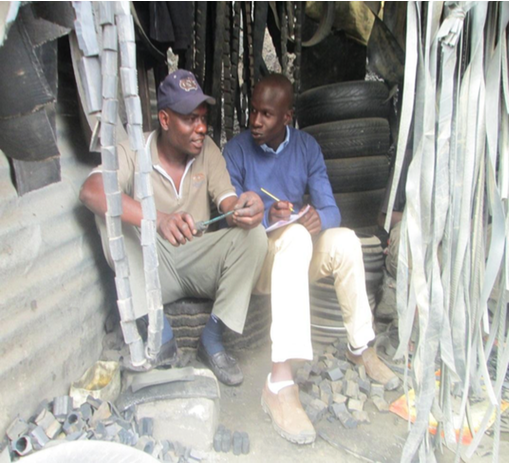 The IRA and AKI have worked very hard to support microinsurance in Kenya by drafting bylaws that encourage the formation, uptake, and best practices of microinsurance. The regulatory framework has clear rules and regulations, thereby creating good conditions for yuCover market penetration. Lack of trust results in latent demand for insurance and plays a major role in the uptake--or lack of uptake--of yuCover. This lack of trust is characterized by nonpayment or slow payment of claims. There is misleading information that goes around from friends to relatives about the negative attributes of insurance which discourages subscription and thus hampers the uptake and penetration of microinsurance products. Marketing will help overcome the misperceptions of poor clients concerning the risks and benefits of insurance. Good marketing strategies will make poor households knowledgeable and aware, which in turn will create trust encouraging them to take up yuCover. yuCover’s marketing strategies were not clear, and it was evident that they have not reached their target population, i.e. poor households. 70% of respondents believed that insurance premiums are exorbitant. Due to this perception, it was established that respondents didn’t seek insurance even if it was virtually offered for free, such as a complimentary service for using another product. Regardless of yuCover being loyalty-based, prospective subscribers still thought and felt that insurance premiums were expensive. No matter the pricing, it was observed that the target population has not built the culture of taking up insurance in general. Gender plays a significant role in the uptake of yuCover. Male respondents tend to take insurance more than their female counterparts as indicated in Table 1 below. 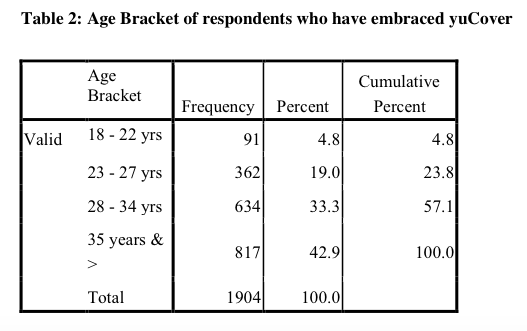 Also, persons above 35 years of age have taken up yuCover more than the youthful 18-34 year old group, as illustrated in table 2. It was further observed that the youthful clients have several mobile numbers and constantly switch between several MNOs to look for attractive offers (e.g. internet bundles, cheap calling rates, and SMS). One interesting observation was that there was virtually no interest in insurance related products within this age group. Clients liked the idea of bundling and diversifying risk events that occur often, e.g. burial, sickness, and crop failure. They thought that yuCover compels customers to join or subscribe to services that they don’t intend to use. The design of yuCover is not clear to the intended clients. 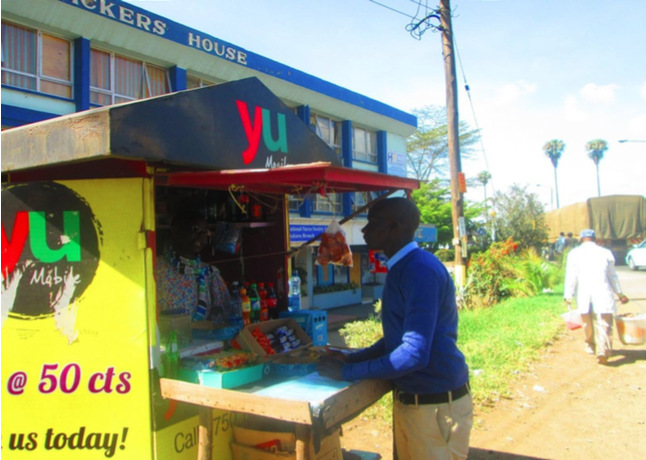 To meet their clients' needs, yuMobile ought to design products that are financially and actuarially sound, and that will provide value to their customers. Due to societal norms and beliefs, the respondents felt that taking yuCover was like projecting their eventual death and cursing themselves to encounter disability. For example, the disability coverage engendered lots of superstitious confusions and beliefs, resulting in yuMobile excluding this coverage from its package (Prashad et al 2013). Lack of diversity, trust, and awareness as well as poor perceptions have contributed to low demand of the yuCover scheme. These issues, among other factors, have suppressed consumers’ need for yuCover and micro insurance products in general. It can be concluded that the uptake of the yuCover scheme is still low as a result of inadequate: knowledge and awareness of the product; literacy and education of microinsurance in general; and product design and constrained distribution channels. Since the product is agent-less, reaching the target population is not an easy task. Alternative distribution channels need to be explored, and new product varieties need to be developed that impact the target population since the product has largely not benefited the intended population. IMTFI video - What do we do?